See end of page for a description of Noémi Speiser and Joy Boutrup’s recent 4-part historical follow-up to Old English Pattern Books: European Loop Braiding – parts I, II, III, and IV. At least these 4 publications are still in print. However they are supplements to Old English Pattern Books for Loop Braiding, and don’t define any terms or concepts already covered there. It covers every known textile braiding technique in the world, plus several “braiding-like” techniques – a totally incredible variety. Beyond the structural analyses, she also gives hands-on suggestions for creating these. I’m sure most textile libraries and guilds have a copy, though it is somewhat obscure because of being self-published. The book isn’t impressive-looking – it’s a large, spiral-bound paperback with no color pictures, but what it contains on braiding can’t be found anywhere else in one volume, and a lot of it probably can’t easily be found anywhere else, period. Very dense – this is not light reading, but is very fun browsing for a textile geek! The Manual does include a large, dense section on loop braiding, but if your main braiding interest is loop braiding, I highly recommend Speiser’s Old English Pattern Books for Loop Braiding. Old English Pattern Books for Loop Braiding is the most complete reference book available on loop braiding, as well as a very interesting account of Speiser’s research into loop braiding. 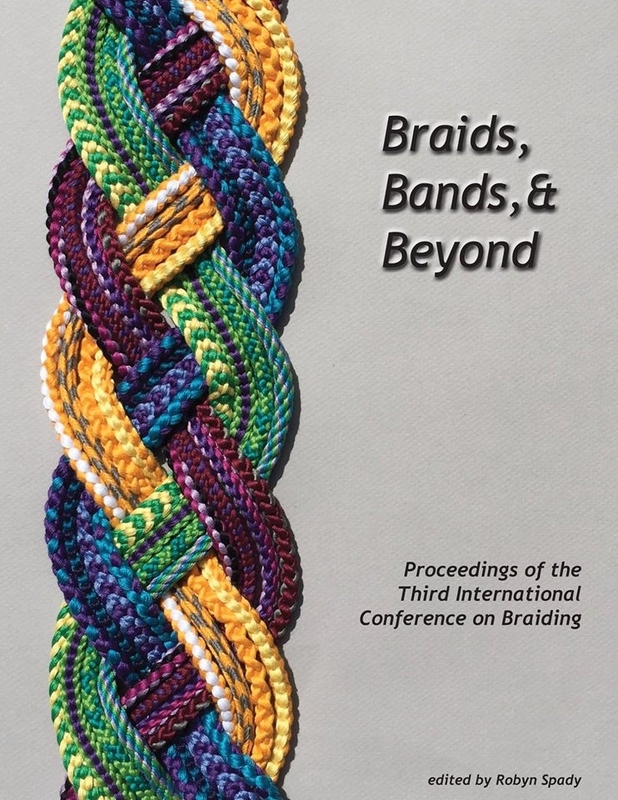 It includes instructions for all the braids in the (then known) 15th and 17th Century European manuscripts on loop braiding – with the exception of the “letterbraids” which have since been decoded by Speiser’s student Joy Boutrup. Many or most of these are braids that require more than one braider working together to make them, but there are plenty of single-braider braids as well. Like the Manual of Braiding, OEPBforLB is a large-format, self-published, spiral-bound paperback with black-and-white illustrations that include many diagrams and drawings. No eye-candy, but a lot of buried treasure. At the time Speiser published these, it was prohibitively expensive to self-publish with color photos. A black and white drawing or diagram can give very clear structural details about a braid, but it can’t convey how beautiful it is, so unfortunately the reader might have less incentive to try it. Old English Pattern Books is much more readable than the highly concentrated/ condensed loop braiding section in the Manual of Braiding. And it was written later, after Speiser had come across the 15th C. loop braiding manuscripts, so it incorporates more of her insights and discoveries. Some of the more abstract sections on braid theory and structure in OEPB can be a little off-putting. But the braiding instructions themselves start from the most basic, beginning level. They are written succinctly and clearly, and illustrated with very clear black and white line drawings. Track plans: Don’t be intimidated by Speiser’s mysterious-looking “track-plan” diagrams above the hand/loop drawings! They aren’t necessary for learning the braids. Track-plans will be easier to understand after you’ve gotten used to the braiding movements and their resulting braids. This charting system is not easy to grasp (speaking for myself! ), but it may be the only braid notation system that accurately represents the 3-D structure of two-layer braids. If you get interested in using or understanding this charting system, these drawings are a great way to learn it. The drawings connect the track-diagrams to the loops on the fingers to show how the dots on the track relate to the shanks of the loops. Each dot represent a braiding strand “head on”. The lines of the tracks don’t represent strands. They represent the path on which a strand moves as it circulates around the braid. If you’ve ever looked at a video of a braiding machine, you’ve seen that each spool follows such a track as it winds around the other spools. Each spool is like one of the dots in a track-plan. The video in that first link demos this with only two of the 16 spools circulating, in this video, you see all 16 dummy spools circulating along the two tracks. This would make a 16-strand tubular braid in plain weave (“over 1, under 1”). This short video clip shows the simplest possible braiding machine – a figure-8 track for 3 bobbins, making a simple 3-strand braid. Most loop braids are twice as complicated as this, because they are made in two layers! Even a simple three-loop braid – if you made it ‘divided’ (forming two braids at once), the track diagram would be two figure-8 tracks like the one in that last video. OEPB is also a textile mystery-story – a saga of how Speiser noticed both the old braids, as well as the obscure manuscripts that turned out to be describing them, in separate museums and private collections, and managed to put them together – deciphering the manuscripts, and figuring out the braid structures they described. This wasn’t easy! The 17th C. loop braiding manuscripts were the first ones she came across, and they were written with almost impenetrable terminology, and with most of the necessary background information completely omitted – apparently considered obvious by the writers. The 15th C. loop braiding manuscripts, which Speiser investigated later, were much easier to understand, and confirmed most of her earlier interpretations. If the more abstract and technical sections of OEPB seem over-the-top, just skip them and go back to them later. This book has plenty for anybody who’s really interested in loop braiding, and it will keep having plenty. There’s always more to find out from it. Speiser’s numbering system for the chapters and illustrations is very complicated – it always takes me a while to process her combination of Roman, Arabic, and alphabet symbols. Also, the formatting of the pages is rather dense, with a lot of information and illustration on each page. I think this is what makes some readers assume the instructions will be difficult to learn, when actually they are very clear if you just try them! A little more space on each page might make them seem more approachable. As someone who frequently cites this book in writing, I have to complain that the title is too long! and even slightly misleading. To me, “pattern books for loop braiding” almost gives the impression that the books in question don’t teach loop braiding itself, but rather, say, color-patterns for loop braids. To me, Old English Loop Braiding Books or better yet Loop Braiding Deciphered would have been more descriptive (and easier to cite!). Available together or separately from BraidersHand in the U.S. In the U.K. they may (?) be available from the publisher (Jennie Parry). These are just the sources I know of, they may be carried elsewhere as well. These monographs delve into European loop braiding history stretching back several centuries before and after the 15th C. manuscripts. One of the oldest extant complete purses with loop braided handles is a gorgeous example from the late 900’s, shown in Volume IV. A few other examples of complex multiple-braider braids have been found dating back to around the 11th C. Narrow textiles rarely survive even that long, so it’s very likely that European loop braiding had its start long before that, especially considering the complexity of some of the earliest known examples. Interestingly, Scandinavia seems to have been a hotbed of loop braiding both early and late, with complex, archaic 3-person braids still being made there as recently as the 1930’s. These monographs were written as supplements to Old English Pattern Books, so they don’t define any terms or cover information already covered there. This is a ‘stopper’ if you really want to understand the content, and don’t have access to OEPB. The technical bits will only be comprehensible if you are familiar with the earlier book. Unlike OEPB, they do have full-color “eye-candy” photographs. They are not instruction books, however the authors describe braids clearly and completely, so many of the ones they describe are learnable if you have already learned the braids and terminology in Old English Pattern Books for Loop braiding, and the unorthodox exchange of Vol. I (and have a partner or two to braid with!). Much historical information about very early multiple-worker European loop braids, extending back centuries before the earliest known manuscripts. The focus is on a peculiar and unorthodox method for two cooperating braiders to exchange their loops in linking their work together, which results in a visible groove/ pattern anomaly down the center of the braid. This method apparently was very common throughout European loop braiding history, yet in the known 15th C manuscripts it was completely omitted (perhaps purposely, the authors suggest!). I wrote more about Parts I and II in a review for the Braid Society newsletter, since reprinted in Issue 13 of LMBRIC (scroll partway down that page to find the review). See my info page about this monograph – 17th C alphabet braids. The Bridgettine Convent in Vadstena, Sweden was instituted in 1384. A small group of nuns were in charge of the textiles of the convent church. About 40 liturgical textiles have been preserved, several with associated loop braids. Great photos of these! Opening section is on Speiser’s “track-plan” system for analyzing loop braids, with several examples. Truthfully, I don’t know that this explanation will make the system any clearer if you haven’t already grasped it from Speiser’s earlier books. But it does present several examples. Then follow several analyses and beautiful photos of extant loop braids and objects incorporating loop braids from various European museums and collections. Fascinating, especially since some of the braids have structures that were not recorded in any of the known loop braiding manuscripts. There are no step-by-step instructions for these. However, many of their methods are clear from the descriptions, as long as you are familiar with the terminology and braids in OEPBforLB, the mysterious “unorthodox exchange” discussed in Volume I, and have a partner (or two) to braid with. See full copyright restrictions and permissions at the bottom of the sidebar (if you are on a small screen, the ‘sidebar’ may appear somewhere other than at the side). Content of this website may not be posted or “reposted” online, sold, or used in fee-based workshops without my permission. It may be shared off-line with certain restrictions – see full copyright info.